The HAL Barstool by Jasper Morrison pairs the unassuming seat shell of the large family of chairs with a height-adjustable swivel pedestal with comfortable footrest, on an elegant circular base plate. 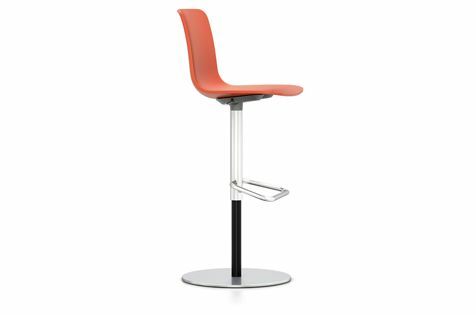 The HAL Barstool's gas spring mechanism sinks comfortably under the user for an optimum seating experience. Dyed-through polypropylene, swivel mechanism, with optional seat cushion (screwed to the seat shell). Height-adjustable tubular steel pedestal, gas spring powder-coated in basic dark, column sleeve and footrest in chrome-plated tubular steel withanti-skid surface. Seat shell and base connection in die-cast aluminium, powder-coated in dim grey. Steel base plate covered with sheet metal.